This classical guitar making book by John S. Bogdanovich has become one of the most popular guitar making references available. “Classical Guitar Making: A Modern Approach to a Traditional Design” is the ultimate guide to building a classical guitar. If you are planning to make your first guitar, this book is a great introductory guide. Only some basic woodworking skills and a minimally equipped shop are required. Alternative guitar building methods are presented here. The book focuses on the use of hand tools. Only a few power tools and a couple of pieces of equipment are necessary. The book was written with the first time builder in mind, but anyone with some guitar making experience could benefit from some of the content. A good builder is always looking to improve their guitar making skills. Due to the large amount of information covered, the book sticks to topic – guitar making. Explanations of basic woodworking techniques have been omitted but can be found on the site. Woodworking references can be found in the bibliography of the book and in the guitar making technical reference section of this web site. 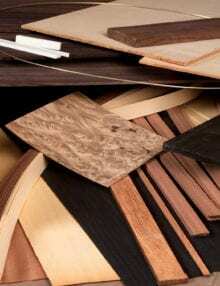 If the reader needs help with some basic woodworking skills, they can consult the mentioned references for information. A 20% Discount for all Subscribers! It’s a true pleasure to write a recommendation for John Boganovich’s book, DVD, products and service. I bought John’s book several years ago principally because of its beautiful illustrations. The book describes the process in clear concise language. John’s writing style flows easily from page to page and is a pleasure to read. Anyone who has done woodworking will appreciate the illustrative nature of the book and attention to important details – all measurements are there. Just before I started my guitar build I discovered John’s DVD. The DVD is excellent! I’ve done a lot of woodworking and as I woodworker I know the pitfalls certain procedures sometime produce. I remember watching the DVD and thinking “John you better warns people about this procedure” virtually every time he did. The DVD (like the book) is clear – real clear. You will see exactly what to do and as importantly you’ll understand why. I’ve bought all my building supplies from John. The most important item was the template – huge time saver and extremely important. I personally wouldn’t build my guitar without it. I also bought a drilling Jig from John. The Jig is very accurate and a must buy. All the wood was purchased through John. It came on time and was competitively priced and of excellent quality. I ran short on some veneer and John shipped my order the same day – no down time for me! By the way if you have a question regarding anything John will get back to you generally same day – super service! As they say the proof is in the pudding and the proof of a guitar build is in how the instrument sounds. I took my new guitar to an expert guitarist and he thought the sound was excellent and full. Yippy it’s alive! In summation – if you want to build a quality instrument and have fun doing it – buy John’s stuff you will be glad you did! This book is incredible, its comprehensive and beautiful as well. The award winning guitar making 10-DVD series demonstrates the construction of a concert quality classical guitar from start to finish. The entire guitar building process is clearly explained and shown in stunning visual detail. Drawings for the guitar as well as many of the jigs and fixtures used in throughout the video are included as PDFs on disc 10. A 20% discount for all subscribers!